This mini desktop printing calculator features an easy to read, large 12 digit display and fast, 2 color printing. The uncluttered keyboard with maximum spacing allows easy use. Reprint function - Press REPRINT key to reprint operation and calculation results. Check function - use the CHECK keys to scroll up to 150 steps of past calculations. Clock/Calendar Function - Press TIME key to display current time and date. 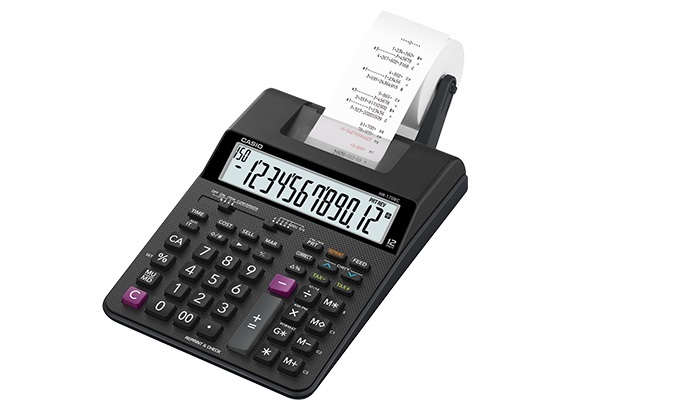 Grand total function, quick correction of mis-entries, currency exchange calculations, and cost/sell/margin calculations are a few of the other features of this powerful printing calculator.